How to set up your terminal and shell with Nerd Fonts for extra icons, and also remove them. Patched programming fonts, such as Nerd Fonts, are those that have been amended to include extra icons related to coding. One reason developers use them is to enhance their terminal prompt, for example as part of the theme Powerlevel9k for the Z shell. This tutorial will explain how to install Nerd Fonts, configure your terminal to use them, as well as how to remove them for your computer. This means you can install Nerd Fonts and then easily be able to use all the extra icons, such as on website or in your terminal. Nerd Fonts gives you many options for downloading it, a full list can be seen on its GitHub page. Here is the option to install using homebrew. Now if you look in the folder you just installed it in, you will see it listed there. Once you have downloaded Nerd Fonts, you can then set your terminal to use it. 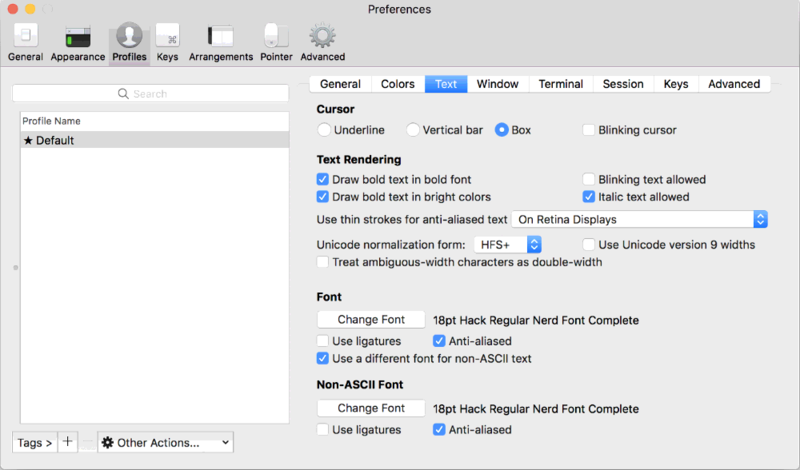 Select the font Hack Regular Nerd Font Complete and adjust the size if your want to. Also check the box for Use a different font for non-ASCII text and select the font again. It should be displaying the new font and icons in the prompt. To remove Nerd Fonts via the command line, first go into the fonts folder it was installed into. Check that it is there using the list command ls. Run the homebrew command to uninstall it. Check it has been removed successfully using ls again. It should not be listed in this folder any more. After this you may then want to reconfigure another font for your terminal. The Nerd Fonts website has more information on the many icons it includes and the ways you can use them. If you want to learn how to install it for another platform besides a mac then a good starting point for this is the Nerd Fonts GitHub page. Below are some links to check out some of my other tutorials. Learn how to configure your own terminal theme using Powerlevel9k for Zsh and iTerm2! How to remove Zsh along with its themes and configuration tools and change your shell back to Bash.